If you are looking for a gift for the baker in your life look no further. 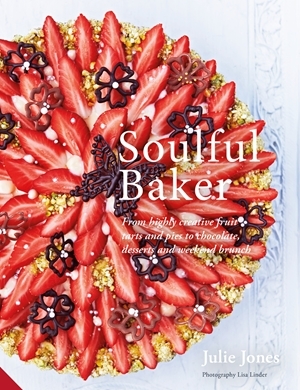 Soulful Baker by Julie Jones is a work of art. I was sent a copy at no charge for my honest review and I am never letting it out of my sight. Just looking through it makes me smile. From apple rose and plum and frangipane tarts, to lemon madeleines and muddle cake, trampoline bread and grissini to chocolate ganache, delizia di limone to banana, pecan, and chocolate muffins and fluffy pancakes, this incredible bake book has all the recipes you need to create something beautiful, imaginative and impressive. Whether you’re making pies or cakes, bread or brunch, this stunning book is full of recipes that bakes that feeds your soul as well as your stomach. Learn to cook crafted, beautifully styled pies, tarts, cakes and bakes, but be sure to cook with Julie’s secret ingredient – love. Julie Jones learnt to cook from her mother. Never anything fancy but always packed with flavour, loaded with butter and made with love. Aged 30, she re-trained as a chef and after spending just a few weeks in a Michelin starred kitchen she realised how flavour could be taken to a whole new level. After her mum was diagnosed with dementia she started to bake with her as a form of mutual therapy, taking photos of their baking days together and posting them on Instagram as a precious record. Her personal story and her talent for baking quickly gained a very large and devoted following (18.8k as of March 2017). Every day she receives message of support and thanks for her inspirational feed, as well as many photographs of the baking that she has inspired in others. Julie loves her creative space on Instagram where she’s discovered great warmth, support and a shared passion for food and baking from her many followers. At home, she runs a weekly supper club that is currently booked up until January 2018. I have been fortunate in my cookbooks lately. This one is extraordinary. If I never make a thing from it I will still get so much joy from just looking at the photos. There are so many beautiful photos in this book. Ms. Jones writes about her passion for baking which helped to ground her as she dealt with her mother’s worsening health problems. She is a true artist in pastry. Just look to her instagram feed to see some of the beauty she has created. The recipes are a mix of simple and complicated. I would not call this a beginner’s cookbook by any stretch. There is an excellent section at the start to inform the reader as to what he/she will need to recreate the recipes in the book both equipment and pantry wise. Ms. Jones’s writing style is pleasant and you almost feel as if she is sitting across from you. The recipes are a mix of the familiar and the new but it’s Ms. Jones’s execution of them that is so remarkable. She decorates her cakes, pies, tarts and cookies in such glorious ways that you almost don’t want to eat them. In fact after looking through this book I was inspired when I made my last pie. I only decorated half as it was a compromise pie – have what I wanted and half what the hubby wanted. The left hand side of my pie was inspired by Ms. Jones’s work. This is a beautiful book. Anyone who bakes will want to have it in their cookbook library.